More and more companies that are not directly in the Information Technology business have been turning toward outsourcing the support and the hosting of their applications in order to address a number of issues that these organizations are facing. These issues include high financial costs of in-house IT services, reliability of these in-house systems, information security, compliance with various data retention laws, loss of focus on core competency (your line of business) and the overall burden of hiring and retaining personnel to manage these systems. Your organization does not need to be in the IT business! DaPron Systems offers several different types of Network Support contracts for companies large and small. We custom tailor our offering to match your unique needs, not like the cookie-cutter type support provided by most providers. Give us a call today for a free initial consultation. DaPron Systems has over 15 years experience as an Original Equipment Manufacturer (OEM) for Intel and Microsoft technologies. We carefully evaluate your needs and business goals to custom design and integrate Servers, Storage Area Networks (SAN), Local Area Networks (LAN), Wide Area Networks (WAN), Wireless Networks (Wi-Fi) and Workstations. We build industry standard equipment utilizing best-practices and best-of-breed software and components all custom designed to meet your requirements. Send us your specifications and we will provide you a proposal that meets and exceeds these requirements, all at a lower price than the big guys. If we are your Network support company, you also have the added benefit of working with a partner that can immediately address any Hardware or Software issue without having to deal with a third party that has no vested interest in offering quick and easy support. Project Management is the process and activity of planning, organizing, motivating, and controlling resources, procedures and protocols to achieve specific goals in scientific or daily problems. A project is a temporary endeavor designed to produce a unique product, service or result with a defined beginning and end, undertaken to meet unique goals and objectives, typically to bring about beneficial change or added value. The temporary nature of projects stands in contrast with business as usual (or operations), which are repetitive, permanent, or semi-permanent functional activities to produce products or services. In practice, the management of these two systems is often quite different, and as such, requires the development of distinct technical skills and management strategies. DaPron Systems employs the Agile technique to assure that your project goals are obtained on time and with near zero defects. Agile Project Management encompasses several iterative approaches, based on the principles of human interaction management and founded on a process view of human collaboration. Agile-based methodologies are typically employed in software development, as well as the website, technology, creative, and marketing industries. This sharply contrasts with traditional approaches such as the Waterfall method. In agile software development or flexible product development, the project is seen as a series of relatively small tasks conceived and executed to conclusion as the situation demands in an adaptive manner, rather than as a completely pre-planned process. Frequent testing of the project under development to insure the final product is consistent with goals and helps to quality assure each phase of the development. Direct involvement of you, the client, during the development and testing of your project to allow for direct feedback on the direction of the final product. Systems engineering management is a discovery process that is quite unlike a manufacturing process. A manufacturing process is focused on repetitive activities that achieve high quality outputs with minimum cost and time. The systems engineering process must begin by discovering the real problem that needs to be solved. The biggest failure that can be made in systems engineering is finding an elegant solution to the wrong problem. DaPron Systems has over 10 years experience in managing large complex multi-year projects and can offer your organization a broad range of skills. Systems engineering is an interdisciplinary field of engineering that focuses on how to design and manage complex engineering systems over their life cycles. Complexity creates engineering challenges such as logistics, requirements engineering, coordination of different teams, testing and evaluation, reliability, maintainability and many others. All of these disciplines are necessary for successful system development, design, implementation, and ultimate decommission and become increasingly difficult when dealing with large or complex projects. Systems engineering deals with work-processes, optimization methods, and risk management tools in such projects. 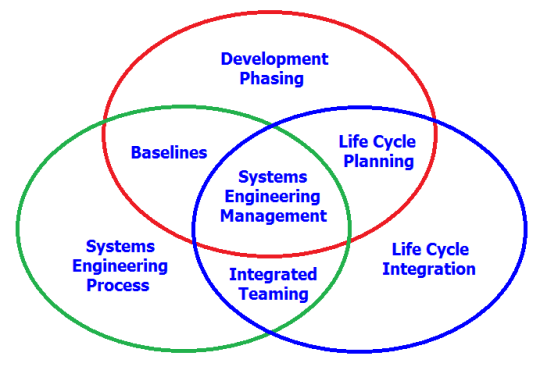 It overlaps technical and human-centered disciplines such as control engineering, industrial engineering, software engineering, organizational studies, and project management. Systems engineering ensures that all likely aspects of a project or system are considered and integrated into a whole.